Metal Grey Aprons There are 6 products. 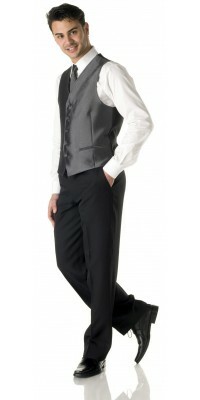 Bar Wear: Metal Grey Aprons and Vests for a modern bar uniform. Made of Shiny-Satin Gabardine, a polyester fabric with a special shiny-shimmering effect, the garments of the Metal Grey series, thanks to their contemporary and “chic” style, are suitable for the Bar Wear of the most up-to-date and fashionable venues. Two models are available, both with bib: the Amelia Apron and the Saronno Apron. Even if they are unisex just like all our aprons, we recommend the Amelia Apron to women and the Saronno Apron to men because of the length and the style of the models. 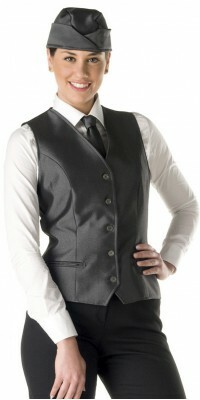 The Metal Grey series also includes two vests with five buttons: the women's Zurigo Vest and the men's Varsavia Vest. In both models the back is made of a black fabric, the same colour of the contrasting stripes of the aprons. In combination: the narrow Seventy tie and the Vibo Forage hat. 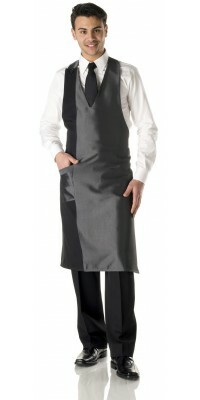 There are many other Aprons and vests for your Bar Wear: discover all the available colours in the upper menu. Unisex short apron, model Ameliawith contrasting side band and pocket applied Metal Grey, glossy-iridescent fabric Made of Shiny-Satin Gabardine, 100% Pol. Unisex long apron, model Saronnowith contrasting side band and pocket applied Metal Grey, glossy-iridescent fabric Made of Shiny-Satin Gabardine, 100% Pol. 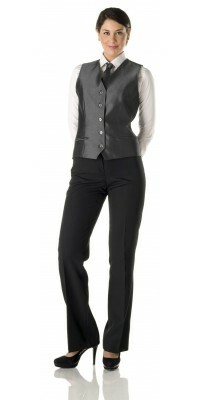 Women's vest, model Zurigo Metal Grey, glossy-iridescent fabricback made of black fabric, lined Immediately available for delivery: sizes from S to XL Made of Shiny-Satin Gabardine, 100% Pol. Unisex vest with 5 buttons, model Varsavia Metal Grey, glossy-iridescent fabricback made of black fabric, lined Immediately available for delivery: sizes from S to XL Made of Shiny-Satin Gabardine, 100% Pol. 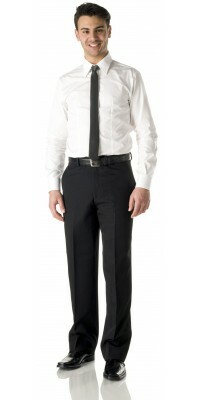 Narrow tie, model Seventy, unisexMetal Grey, glossy-iridescent fabricone sizeMade of Shiny-Satin Gabardine, 100% Pol. Forage hat model Vibo, unisexMetal Grey, glossy-iridescent fabric Adjustable one sizeMade of Shiny-Satin Gabardine, 100% Pol.